✓ Raine Musngi has been featured in Lopez Link, an online newsletter of the Lopez Group of Companies. 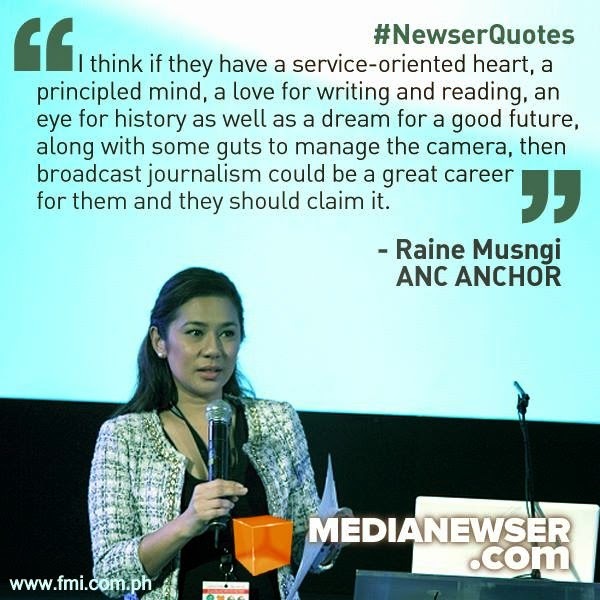 The writer, Dulce Festin-Baybay, notes Raine's ability as a "multitasker," and calls her the "leader of the daylight-challenged and sleep-deprived evening shift of the ABS-CBN News Channel." Baybay also had a chance to talk to the legendary Peter Musngi about his hard-working daughter. “Masipag yan. She has a mind of her own and is quite independent," Peter said of his daughter. ✓ DigitalFilipino recently unveiled the 39 winners at this year's DigitalFilipino Web Awards. In the Broadcast News category, ABS-CBNNews.com and InterAksyon reigned supreme among the network news websites. According to the website's founder Janette Toral, this year’s awards recognize the changes with the way websites are being perceived now and how it's valued, adding that high quality and relevant content that can be easily shared through social media were given importance in this year’s awards. ✓ TV Patrol anchor Noli De Castro denied giving special treatment to Globe Asiatique (GA) Realty Holdings Corp., during his appearance in a Senate housing committee hearing Tuesday. “There’s no special [treatment] here. There’s no special treatment, only a special program," De Castro said. De Castro was the country's VP and chairman of the Housing and Urban Development Coordinating Council (HUDCC) when the alleged housing scam took place. He went on to describe the housing project as a "special project," saying: "Kinonsidera namin ito bilang special project dahil sa mas malaki ang pondo. Bukod pa sa kumpleto ito sa mga amenities kung saan ay mayroon palengke, eskwelahan, simbahan at marami pang ibang karagdagan tulong para sa ating mga kababayan partikular sa mga worker na nagnanais magkaroon ng reasonable bahay."